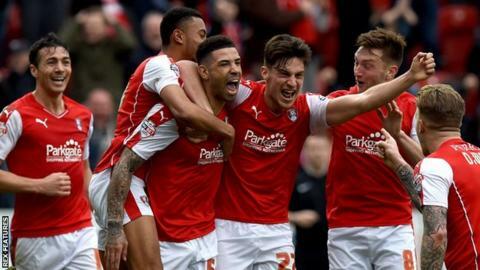 Leon Best (centre) scored his first goals for Rotherham since joining them in November. Leon Best scored a last-minute equaliser as Rotherham recovered from three goals down to draw with Derby. With seven minutes remaining Danny Ward's composed finish looked to have given the Millers a consolation goal. However, Best's two headers rescued an unlikely point for Rotherham. The Rams had run riot early in the second half with Tom Ince striking twice - first rifling a low shot home before rolling the ball into an empty net - in between Chris Martin's tap-in. Millers boss Neil Warnock's decision to bring on Republic of Ireland international striker Best with 20 minutes remaining proved to be an inspired one, as the relegation-threatened hosts stay a point adrift of safety. Best - who was sent off in his first match for the club against Leeds in November - twice headed in at the back post, with his first coming just two minutes after Ward's fourth goal of the season. Derby struck three times within 10 second-half minutes as a poor headed clearance was collected by Ince, whose brilliant first-time shot gave Lee Camp no chance and nestled in the left corner. Nice link-up play with Cyrus Christie saw Martin net for the 14th time this season, before the two goalscorers combined as Martin crossed for Ince to net the easiest of goals. Derby's alarming surrender of their lead cost Darren Wassall's side two vital points in their push for promotion, as they fell four points behind both Hull and Brighton above them with both having games in hand. "I can't think of another comeback as good as that, but I forget. "It's the sweetest because we were playing against a very good team and the players they have got and that's why I am enjoying the challenge. "They will be going home thinking they have lost the game, you shouldn't concede three goals in the final 10 minutes. "This is the result of the season, never mind the day. I don't think there will be another one like this. "We were 3-0 down against Derby County, with the players they have got, and have got a point." "For 82 minutes I thought that was the best we have played all season. "I asked for a reaction after QPR and we certainly got it. What happened after that was baffling, inexplicable, inexcusable and everybody connected with the football club is absolutely gutted. "You feel like you have lost. With Rotherham's form we would have taken a point at the start of the game. But at 3-0 after 82 minutes you are expected to win the game. "We need to work on our game management. We should be going home with all three points and we are going home with one in a very bad frame of mind. "The fans were right to boo us off. They saw us dominate Rotherham for 80 minutes, we could have been 6-0 up we were that good." Match ends, Rotherham United 3, Derby County 3. Second Half ends, Rotherham United 3, Derby County 3. Foul by Leon Best (Rotherham United). Foul by Lee Frecklington (Rotherham United). Goal! Rotherham United 3, Derby County 3. Leon Best (Rotherham United) header from the centre of the box to the top right corner. Assisted by Danny Ward with a cross. Joe Newell (Rotherham United) wins a free kick in the defensive half. Attempt saved. Grant Ward (Rotherham United) right footed shot from outside the box is saved in the bottom left corner. Assisted by Richard Smallwood. Attempt saved. Darren Bent (Derby County) right footed shot from the centre of the box is saved in the centre of the goal. Assisted by Richard Keogh. Goal! Rotherham United 2, Derby County 3. Leon Best (Rotherham United) header from very close range to the centre of the goal. Assisted by Stephen Kelly following a corner. Attempt missed. Stephen Kelly (Rotherham United) header from the centre of the box misses to the right. Assisted by Joe Newell with a cross following a corner. Corner, Rotherham United. Conceded by Richard Keogh. Attempt blocked. Grant Ward (Rotherham United) right footed shot from outside the box is blocked. Assisted by Joe Mattock. Corner, Rotherham United. Conceded by Jason Shackell. Attempt blocked. Joe Newell (Rotherham United) right footed shot from the left side of the box is blocked. Assisted by Lee Frecklington. Goal! Rotherham United 1, Derby County 3. Danny Ward (Rotherham United) left footed shot from the centre of the box to the bottom right corner. Assisted by Grant Ward. Attempt missed. Craig Bryson (Derby County) right footed shot from outside the box is too high. Assisted by Nick Blackman. Substitution, Derby County. Nick Blackman replaces George Thorne. Substitution, Derby County. Darren Bent replaces Chris Martin. Attempt blocked. Stephen Kelly (Rotherham United) left footed shot from outside the box is blocked. Attempt missed. Lee Frecklington (Rotherham United) right footed shot from outside the box is too high. Assisted by Joe Newell. Attempt saved. Tom Ince (Derby County) left footed shot from the right side of the box is saved in the centre of the goal. Assisted by Jeff Hendrick. Substitution, Rotherham United. Leon Best replaces Paul Green. Substitution, Rotherham United. Joe Newell replaces Matt Derbyshire. Attempt saved. Chris Martin (Derby County) right footed shot from outside the box is saved in the centre of the goal. Assisted by Craig Bryson. Attempt blocked. Bradley Johnson (Derby County) left footed shot from the centre of the box is blocked. Assisted by Jeff Hendrick. Goal! Rotherham United 0, Derby County 3. Tom Ince (Derby County) left footed shot from the centre of the box to the centre of the goal. Assisted by Chris Martin. Goal! Rotherham United 0, Derby County 2. Chris Martin (Derby County) right footed shot from very close range to the bottom left corner. Assisted by Jeff Hendrick. Attempt missed. Jeff Hendrick (Derby County) right footed shot from the centre of the box misses to the left. Assisted by Cyrus Christie. Attempt missed. Danny Ward (Rotherham United) with an attempt from the centre of the box is high and wide to the right. Assisted by Lee Frecklington. Attempt blocked. Lee Frecklington (Rotherham United) left footed shot from outside the box is blocked. Attempt missed. Chris Martin (Derby County) right footed shot from very close range is close, but misses to the left. Assisted by Cyrus Christie. Goal! Rotherham United 0, Derby County 1. Tom Ince (Derby County) left footed shot from the centre of the box to the bottom right corner. Attempt blocked. Craig Bryson (Derby County) left footed shot from outside the box is blocked. Jeff Hendrick (Derby County) wins a free kick in the defensive half. Foul by Danny Collins (Rotherham United).